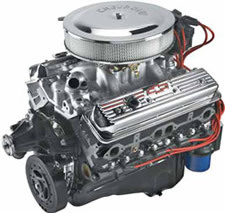 Complete from top to bottom, the Chevy crate engine 350 HO Deluxe comes pre-assembled with the , carburetor, water pump, and distributor. It offers you an incredible performance value — one that delivers big-time performance without costing you big-time money. NOTE: Distributor with melonized steel gear MUST be used with long blocks and partial engines with steel camshafts, or engine damage will occur. Comes with counterweighted flexplate for automatic transmission; requires counterweight flywheel for manual transmission.